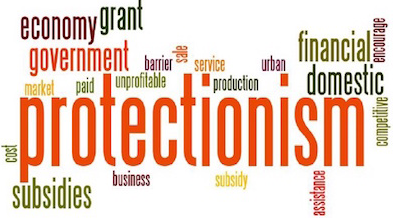 Protectionism is a policy of protecting the domestic businesses from foreign competition by applying tariffs, import quotas, or many types of other restrictions attached to the imports of foreign competitors’ goods and services. There are many protectionist policies in place in many nations despite the fact that there is a popular consensus that the world economy, as a whole, benefits from free trade. Government-levied tariffs − The best form of protectionist measure is the government-levied tariffs. The common practice is raising the price of the imported products so that they cost more and hence become less attractive than the domestic products. There are many believers that protectionism is a helpful policy for the emergent industries in the developing nations. Import quotas − Import quotas are the other forms of protectionism. These quotas limit the amount of products imported into a country. This is considered to be a more effective strategy than protective tariffs. Protective tariffs do not always repel the consumers who are ready to pay higher prices for imported goods. 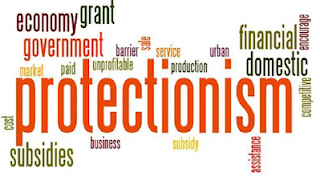 Mercantilism − Wars and recessions are the major reasons behind protectionism. On the other hand, peace and economic prosperity encourage free trade. In 17th and 18th centuries, the European monarchies used to rely heavily on protectionist policies. This was due to their aim to increase trade and improve the domestic economies. These (currently discredited) policies are called mercantilism. Reciprocal trade agreements − Reciprocal trade agreements limit the protectionist measures in lieu of eliminating them fully. However, protectionism still exists and is heard when economic hardships or joblessness is aggravated by foreign competition. First is to make sure that foreign countries do not subsidize exports so that market incentives are not distorted and hence efficient allocation of activity among the countries is not destroyed. The second purpose is to assure that international companies do not dump their exports in an aggressive manner. These mechanisms are meant to augment free trade. Great Britain started to end the protective tariffs in the first half of the 19th century after achieving industrial leadership in Europe. Britain’s removal of protectionist measures and acceptance of free trade was symbolized by the repeal of the Corn Laws (1846) and various other duties on imported grains. Europe’s protectionist policies became relatively mild in the latter half of the 19th century. However, France, Germany, and many other nations imposed customs duties to shelter the improving industrial belts from British competition. Customs duties fell sharply in Western world by 1913, and import quotas were almost never used. The damage and displacement in World War I inspired an increasing raise of customs barriers in Europe in the 1920s. Great Depression of the 1930s resulted in record levels of unemployment which led to an epidemic of protectionism. The United States was also a protectionist country, and the levied tariffs reached the top during 1820s and the Great Depression. The Smoot-Hawley Tariff Act (1930) raised the average tariff on imported goods by about 20 percent. US protectionist policies started getting vanished by the middle of the 20th century. By 1947, the United States became one of the 23 nations to sign reciprocal trade agreements (the General Agreement on Tariffs and Trade - GATT). GATT, which was amended in 1994, was taken over by the World Trade Organization (WTO) in Geneva (1995). WTO negotiations have led to reduced customs tariffs by most of the major trading nations.